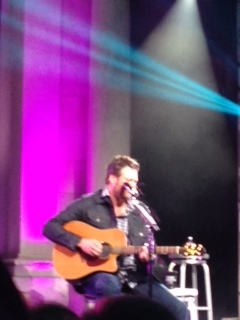 I was able to see Blake Shelton perform live last night at a Super Bowl party in NYC. He pulled up a chair and sat down and played and sang solidly for over an hour. I know that people truly love him and his music. He is a very personable guy and has a great voice and really can connect with an audience. I was amazed at the people around me who knew every word of every single song. It was funny because since the concert was in NYC, Blake Shelton asked, “Do we have any rednecks or hillbillies in the crowd?” There was a large roar from the audience. He said, “so … this isn’t a typical New York show.” It is funny how there is this very regional idea of music tastes that is very real, but not necessarily exclusive. I am sure there are plenty of people in NYC who like country music, but it is obviously not the norm, and the fact that the Super Bowl brought in so many people from all over the country made the mix different from the norm.